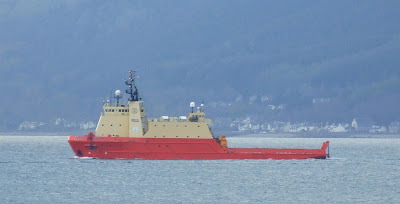 After spending a week at Faslane, the United States Navy Military Sealift Command's submarine support vessel CAROLYN CHOUEST, together with the small nuclear submarine NR-1, sailed this afternoon. Both vessels are seen as they headed past the entrance of the Holy Loch. As she is only capable of operating at speeds of up to 5 knots using her turbo-electric drive, NR-1 is towed wherever she goes, although she is manned by a crew of eleven - three officers and eight enlisted men. She is capable, when necessary, of spending up to thirty days submerged, thanks to her nuclear power plant. The final view shows the duo setting off down the main channel, and out to sea. As well as her own civilian crew of 15, CAROLYN CHOUEST carries a support crew for NR-1, all of whom are submarine trained. Dont fancy the tow in rough seas! Great shots, John as usual! The light was too bad by the time they got to me to get any meaningful pics!